During the last six decades, Yang-Mills theory has increasingly become the cornerstone of theoretical physics. It is seemingly the only fully consistent relativistic quantum many-body theory in four space-time dimensions. As such it is the underlying theoretical framework for the Standard Model of Particle Physics, which has been shown to be the correct theory at the energies we now can measure. … It has been investigated also from many other perspectives, and many new and unexpected features have been uncovered from this theory. In recent decades, apart from high energy physics, the theory has been actively applied in other branches of physics, such as statistical physics, condensed matter physics, nonlinear systems, etc. This makes the theory an indispensable topic for all who are involved in physics.The conference celebrated the exceptional achievements using Yang-Mills theory over the years but also many other truly remarkable contributions to different branches of physics from Prof C N Yang. 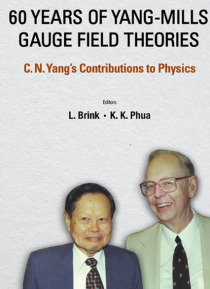 This volume collects the invaluable talks by Prof C N Yang and the invited speakers reviewing these remarkable contributions and their importance for the future of physics.